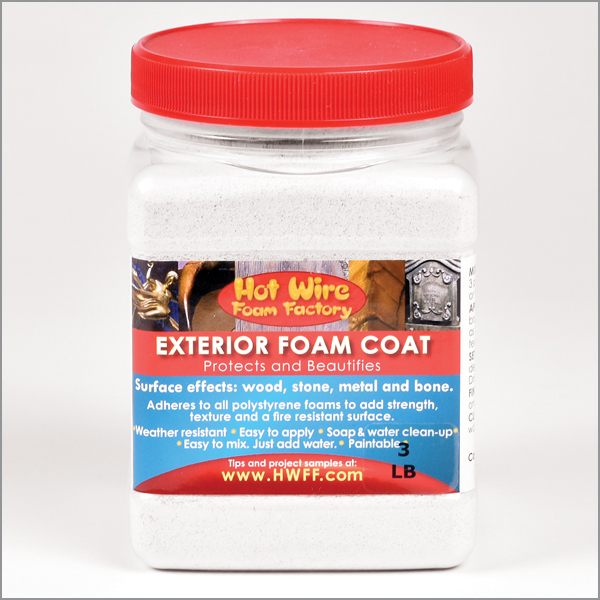 Rock hard finish for all of your outdoor (and indoor) foam projects. This stuff is super tough. It is not sandable. Has a rough stone feel when dry. It can be troweled smooth, or brushed to make a super rough finish. • Adheres to polystyrene foams. • Forms a weather resistant surface. • Easy to mix. Just add water. • Apply with paintbrush or trowel. • Many decorative surface textures can be created. • Soap and water clean-up. APPLYING: If using extruded foam (ie Blueboard or Pinkboard) roughen surface with coarse sandpaper. Fill big cracks and holes by applying pasty mixture with a trowel. You may add more water until mixture is thin enough to apply with a paint brush, although thinning weakens coating. Can be applied with a standard spray hopper. Use thinned mixture to texture large areas. For best strength apply at least 1/4" (6mm) thick. Multiple coats may be applied. Try texturing surface before coating sets. FINISHING: Remove dust before painting. This product goes on rough and is not sandable. Finish as the surface is setting up. CLEAN-UP: Clean tools and brushes with clean soapy water before coating hardens.